Has Steven Moffat cryptically revealed the next Doctor Who companion? It looks as though Doctor Who could be signing up a new companion next fall. Executive producer Steven Moffat may just have pointed us towards her - and it's someone we've seen before on the show! Joss Whedon reveals just why The Avengers revolves around Captain America. The Star Trek sequel begins production, and the main cast is all confirmed. The Hobbit searches for the right audience, and Prometheus shoots for an epic scope. The Fantastic Four reboot may have found an up-and-coming director to take on the project. Plus key updates on the futures of Supernatural, American Horror Story, Game of Thrones, The Walking Dead, Warehouse 13! Spoilers from here on out! "[The Avengers] is very much about people who are alone - because I'm writing it. [Captain America] is kind of the ultimate loner in that way. There is an anachronism to him, and Chris and I have always tried to, without making it goofy or too obvious, make him that same grounded '40s Steve Rogers he was in the other movie." "You get them in a world, the world of S.H.I.E.L.D., where they fit in. And you say upfront, these are monsters. These are freaks. These are not you and me, and what are they doing here? How are they human beings? Let's just investigate that." "The movie is definitely epic in its scope. One of the filmmakers that we ended up talking about to a fair degree of redundancy was David Lean, who directed ‘Lawrence of Arabia.' We wanted to make the movie feel big by having the characters be small in big spaces. That connected to the larger themes we were talking about - that we're all just these little gnats crawling around on our little planet." "The story is very much a children's story so deciding how to tell this was one of the first things we had to do. Who is the audience? It is very distinctly different, tonally, to ‘Lord of the Rings' until the very end and then you begin to see the world of Middle-earth opening up… but, having said that, we felt that it is the same audience [who will come to see the films] and then you start to worry because it is easy to repeat yourself. It is quite a similar journey, you're going from the Shire to a large, dangerous mountain." "They've got a great director [Tim Miller] on the movie, they've got a great script. I may or may have not seen some sort of test of footage that would blow your mind if you saw it and go holy crap and that's Deadpool in costume. Katana swords, guns, shooting people's faces off and making me laugh. And I may or may not have seen something that looks just like that. And you've got what would amount to the first R Rated X-Men movie. Because that script is R Rated. They may or may not have wanted to shoot eight minutes to see how it would play. And all I can tell you, it's close. It's closer that it's even been to going, or going Naaah, that's too scary a proposition to make a R Rated Deadpool movie." "She's brittle and she's a fighter. There's blood and vampires and all of that, but we focus on the mother-daughter relationship." Here's a promo and sneak peek at next week's episode, "Enemy of My Enemy." Here's a promo for next Friday's episode, "Chuck vs. the Bullet Train." And here are some promo photos. You can also check out the official description below. A MISSION ABOARD A JAPANESE BULLET TRAIN SPIRALS OUT OF CONTROL, PUTTING THOSE CLOSEST TO CARMICHAEL INDUSTRIES IN DANGER – ANGUS MACFADYEN GUEST STARS - When a mission in Japan becomes a hostage situation, Sarah (Yvonne Strahovski) and Chuck (Zachary Levi) must face the merciless Nicholas Quinn (guest star Angus Macfadyen, "Braveheart") aboard a speeding Japanese bullet train. Meanwhile, the mission leaves Casey with an impossible decision. Joshua Gomez, Sarah Lancaster, Ryan McPartlin, Scott Krinsky, Vik Sahay and Mark Christopher Lawrence. SARAH MUST KEEP A SECRET FROM CHUCK IN ORDER TO ACCOMPLISH A MISSION - ANGUS MACFADYEN GUEST STARS AS ‘NICHOLAS QUINN' - After a harrowing mission, Sarah (Yvonne Strahovski) returns to Chuck (Zachary Levi) with a huge secret. Meanwhile, Ellie (Sarah Lancaster) and Awesome (Ryan McPartlin) are presented with a new opportunity that could change their lives. Adam Baldwin and Joshua Gomez also star. CHUCK'S FINAL MISSION BRINGS HIM BACK TO HIS ROOTS AS HE FIGHTS TO SAVE HIS FUTURE – ANGUS MACFADYEN AND LINDA HAMILTON GUEST STAR - Chuck (Zachary Levi) enlists his family, friend and some unexpected allies as he races to stop Nicholas Quinn (guest star Angus Macfadyen, "Braveheart") from destroying everything Chuck has built over the past five years. Yvonne Strahovski, Joshua Gomez, Adam Baldwin, Sarah Lancaster, Scott Krinsky, Vik Sahay and Mark Christopher Lawrence also star. Here's a promo for the next episode, "Of Mouse and Man." Here's a promo for the next episode, "The Slice Girls." "It happens by a sure twist of fate and the Cas that they find is not exactly the Cas that left them. 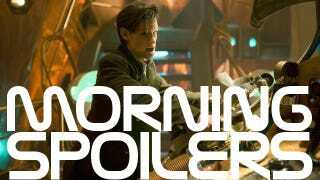 We usually will end [the season] with some sort of a cliffhanger, which will inform the next year. And then we may get into a room and say, 'OK, we've painted ourselves into this corner, now how do we paint ourselves out?'" "Yes, he is [coming back]. I don't know how, but he is. He's not going to come back as Bobby in the classic, ‘Hey, I'm Uncle Bobby and I drink too much and I'm kind of curmudgeonly,' but he's going to come back in some way, shape, or form." "We'll see the return of Mark Pellegrino as Lucifer, he's going to be tormenting me. I've been seeing visions all season long, and now we're going to see what those visions are. Sam's been fighting them by himself, but now we're going to see them tangibly. We're going to see Sam break." "The last run of shows is very Leviathan heavy. And Sam will need a lot of help - Sam goes wackoidal in episode 17, and Dean has to bring him back from the brink of insanity. Some old friends show up to help him with that. That's as much as I'll tease!" Here's a sneak peek at tonight's second season premiere, "Turn This Mother Out." Additional reporting by Marykate Jasper and Charlie Jane Anders.